Floating in a private Watsu therapy pool. Testing your balance (and bravery) on a 35-foot-high challenge course. Connecting with your inner cowgirl during a nurturing equine experience, or on a bucking mechanical bull. Hitting your target in an archery class. 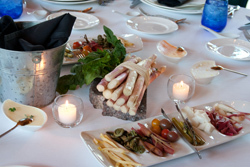 There are endless ways to work up an appetite at Travaasa Austin, a serene, eco-friendly retreat and spa in the Balcones Canyonlands Preserve about a half-hour from downtown Austin. Lucky thing there's Executive Chef Benjamin Baker (a.k.a. Chef Ben) to keep hunger at bay. In charge of Jean's Kitchen (above), Travaasa's casual restaurant and bar, he turns out appealing and satisfying dishes for breakfast, lunch and dinner -- and there's always something available to snack on in-between meals as well. In tune with the healthy dose of activities on tap (or dose of healthy activities, as it may), Chef Ben's fare is packed with fresh, organic and locally sourced ingredients. 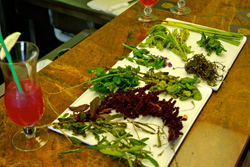 Key to this is his relationship with an Austin distributor, Farm To Table, that partners with farmers within a 200-mile radius to supply locally grown farm products to area restaurants, independent groceries and other folks. There's something very soothing about finding fruits and vegetables that grow in your own backyard when you're halfway around the world. This happened to me recently on a trip to Istanbul and Izmir, Turkey. 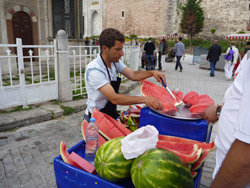 As we were walking around the Old Town of Istanbul -- viewing the centuries of history still alive at the Hagia Sophia, the Blue Mosque, the Underground Cistern and the Museum of Topkapi Palace -- there, suddenly, were a number of vendors serving freshly sliced watermelon. And not just any watermelons but huge green watermelons that looked very similar to the watermelon that was the first thing I grew in my garden and in a way launched this site (story here). The watermelon I grew was an Ali Baba heirloom watermelon, which originated nearby in Iraq, but these were very similar looking -- especially in size. I later learned that Turkey is the second biggest producer (after China) of watermelon. As you can see, the ones they were serving look absolutely wonderful. 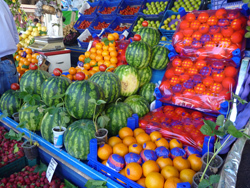 Also available (in abundance) were artichokes (which have a very short season), oranges (which they fresh squeezed at stands in Ephesus), almonds, asparagus, olives, cucumbers and tomatoes. To the right is just one display at the Kemeralti Bazaar in Izmir. Later, as we drove from Izmir to Ephesus, the rows and rows of almond trees reminded me quite a bit of driving down through Central California on a summer day. One of the new trends we discovered in Istanbul is the bringing back of historic Turkish and Ottoman cuisine using fresh seasonal produce. We found this at both the Tugra Restaurant at the Ciragan Palace Kempinski (a former Ottoman palace) and at Nar Lokanta restaurant, which also runs a culinary institute and has a gorgeous vertical botanical garden running through it. I'm hoping to have a recipe to share soon and then we can all enjoy historic Ottoman cuisine using the fresh seasonal produce from our own backyards. 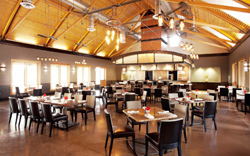 The opening of a new restaurant in the Napa Valley always brings about bit of a ripple in the foodie community. In this case, it's the new Goose & Gander, which opened last week on the same spot in St. Helena where the former Martini House once stood. 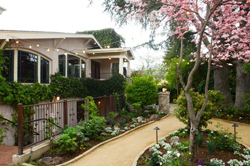 With a focus on locally sourced ingredients in both the dining room, overseen by Partner/Executive Chef Kelly McCown, and in the artisan cocktails concocted by Bar Manager Scott Beattie, those seeking a quintessential farm-to-table experience in Napa should be pleased. If you're interested in toasting the opening at home, Beattie was kind enough to share his recipe for the Cucumber Collins. Even better -- wait until Memorial Day, when you can enjoy a summer cocktail in the restaurant's newly renovated garden. Add the vodka, lemon juice, yuzu juice and simple syrup to an empty 16 oz. mixing glass. Add enough ice to fill the mixing glass completely with ice, seal it up, shake hard a few times to mix, unseal, leaving all the contents in the metal half of the shaker. Add the seltzer to the metal half of the shaker, and then dump the contents into a 12 oz. Collins glass. It should fit in nicely with ice filling the glass from the bottom to the top. Using a straw of the back end of a stirring spoon, carefully slide several slices each of the pickled and non-pickled cucumbers down the sides of the glass, so that the ice pushes the cucumber slices attractively up against the glass. Add the vinegar, mirin and sake to a medium-sized pot and bring to a boil. Add the sugar and stir to dissolve. Next add the blueberries, bring back up to a boil, and summer for 2 minutes to bleed out the color. Allow the mixture to cool to room temperature. Using a mandolin, slice the entire cucumber up to about the width of a quarter, not paper thin, not too thick. Reserve half of the cucumbers for pickling; the other half will stay non-pickled. Stain the blueberries out of the pickling liquid, and then pour the liquid over half of the cucumbers and let them rest for about 2 hours or long enough to stain them purple. They will last about two weeks in the fridge.